Home Lifestyle Where To Spend Halloween In Lebanon? Here are my five favorite Halloween events for the weekend. 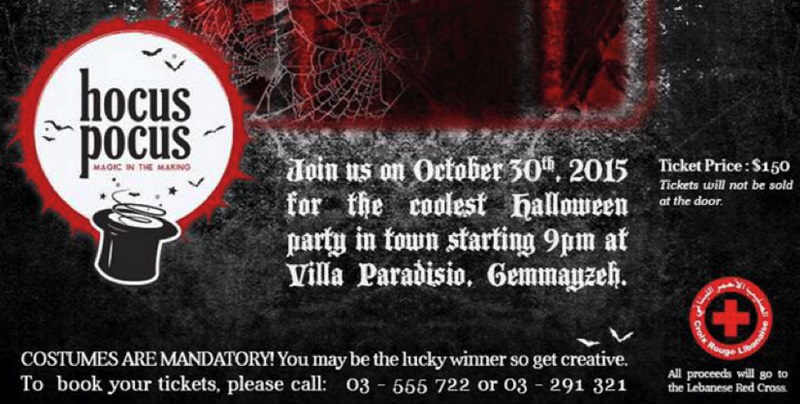 You can check out the full list of Halloween events and parties in Beirut [here]. 1- Mix FM’s Decadeath: It’s hosted by DJ Rodge and is one of the biggest Halloween parties in Beirut every year. For tables reservations: Call 70999104. 3- ARCADE APOCALYPSE at CosmoCity: Aliens have landed in Beirut to exterminate boredom and they’re already organizing parties. There are also parties planned at Junkyard in Mar Mikhail, The Angry Monkey in Gemmayze and Uruguay Street. Bar 360 at Le Gray Hotel which reopened last week is also organizing a Halloween night. If you like pumpkin carving, there’s an event at Alice Edde Shop in Jbeil on Saturday Oct 31 2015 from 04:00 pm until 07:00 pm.